As my family and most of my friends know, the holidays are a difficult time for me. My father died on Christmas Eve when I was a freshman in college, a few years ago. As I have aged, I seem to miss him more and more. It occurred to me recently, that I have not had my father in my life for nearly 50 years. With the recent cold spell we have "enjoyed" here in Iowa, I was getting antsy and needed to get outside with my camera. 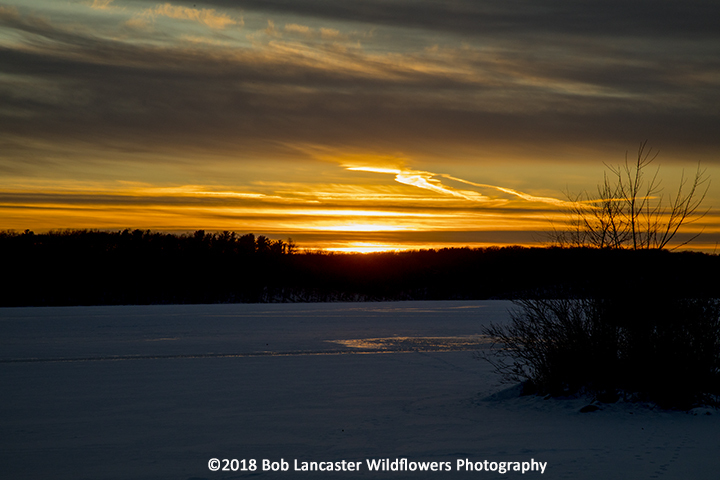 A couple of days ago, I charged the batteries on my 5D, bundled up and headed to Lake Macbride with the goal of catching a sunset. There were lots of animal trails in the snow from rabbits, squirrels, deer and even a pheasant. However, there was not a lot of human activity to be seen. I walked towards a popular fishing spot that poked out into the lake with a wide view towards the setting sun. The wind was blowing powdered snow in my face, the temperature was -8 degrees with a wind chill approaching -17 degrees. I had on three layers over most of my body in an attempt to keep warm as I walked the 3/4 miles to the lookout. There were several blue sky openings along with several layers of clouds, so I was hopeful for some color in the sunset. As I waited, I noticed over twenty contrails in the sky, I guess Iowa really is "one of the fly-over states". The sun was sinking quickly. The sky was turning. As the sky became more colorful, I suddenly realized that the sadness in my heart was fading. It was than that I remembered how my father loved to be outside as the sun was sitting.